Just beutiful. Each flower is about 4-5 inches wide. 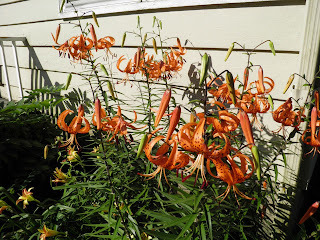 My mother’s orange lilies are in full-on visual assault right now. These lilies were actually a surprise when they arrived in the yard over a decade ago. We found the first one growing up through the centre of a climbing rose. recurving petals are said to resemble a turban. We can only assume that a bird “left” it for us. None of us planted it and none of the neighbours have these marvellous flowers. They are majestic to say the least. We have grown them upwards of 4-5 feet high. We have since parlayed that single plant into at least 25-30 over the ensuing years. The actual name is Lilium superbum. It’s a native to eastern and central North America. 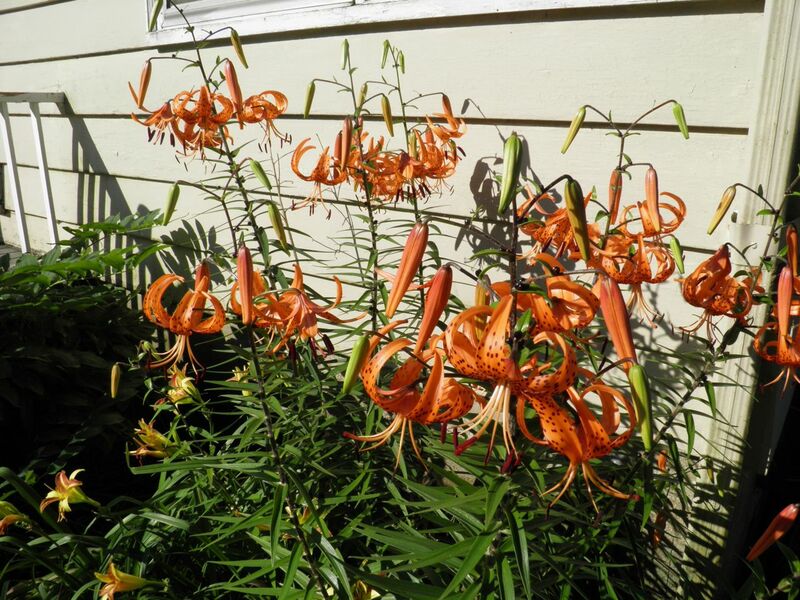 Other names include Turk's cap lily, turban lily, swamp lily or American tiger lily. They supposedly have from 3-7 blooms but ours must be extremely happy as we have had upwards of 12 blossoms per plant occasionally. 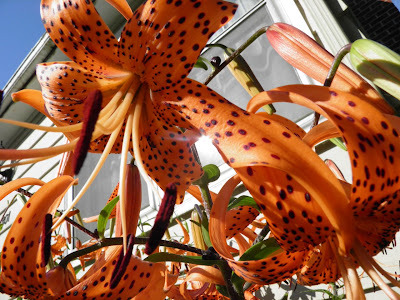 Tiger lilies come in colours from deep yellow to bright orange through to fire engine red. Our variety is orange only and hasn’t had any dormant genes make an appearance as different colours…yet. The bulbs of Lilium superbum were once a food source for Native Americans. I’m not sure if I could bring myself to eat one (which if you read my blog would know is strange for me). It’s just they’re so beautiful. Bulbils sitting on the leaves at the stem. They're the little black balls. Click to enlarge. I’ll eat a weed, but something that can brighten the garden? Never! Or almost never… Apparently they’re quite “starchy.” Asian countries still use lily bulb in their cuisine. The bulbs are like any other lily bulb you may be familiar with, being composed of tight, white, fleshy scales. A very sturdy stem rockets from the pointed top in Spring. As the bulb grows it will subdivide and propagate itself. 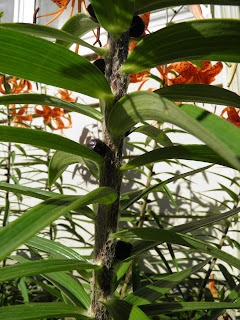 All parts of the lily seem to be able to create some from of bulb or seed. 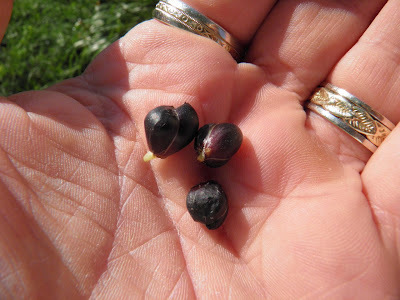 The actual bulb creates small bulblets, the stem produces bulblets underground, our species produces stem bulbils and (of course) the flowers produce seeds. Ours is quite prolific with stem bulbils. This is how we’ve been propagating. The bulbils sit on the stem supported by the leaves. I have seen up to three of these little wonders sitting at the juncture of leaf and stem. As the bulbils mature they naturally detach from the stem and roll off onto the ground. We’ve been gathering and planting them for years. The first year all that emerges is a distinctive single lily leaf. The next year a plant under 1 foot high, the next year they bloom if they're in a happy spot. Then the whole process begins again. If you have friends with this lily ask for some of the bulbils. You won’t regret it. growth coming out from the tip.